Jade Magic 100% natural. No GMO's. 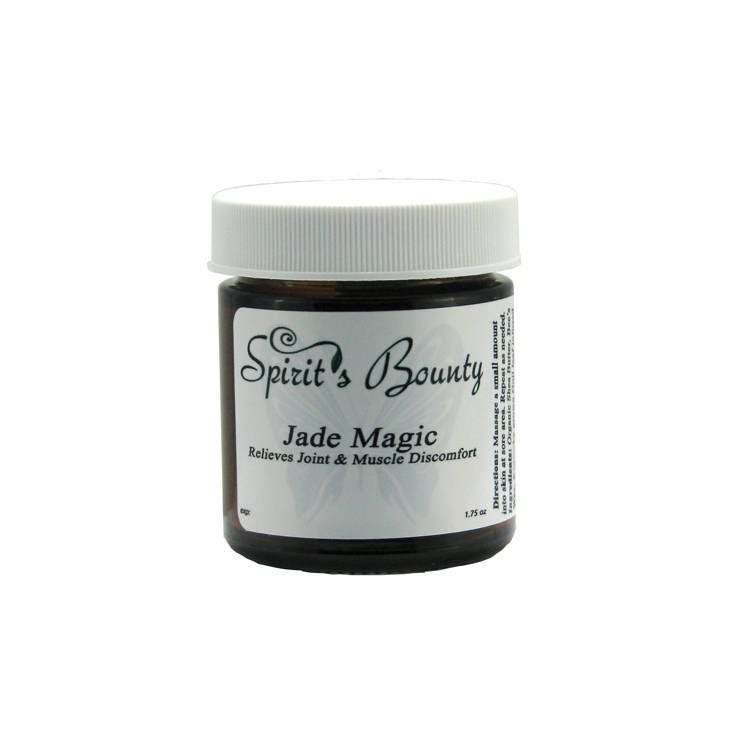 Jade Magic wonderfully combines the power of plant oils and waxes with the energetics of homeopathic ingredients to make an ointment that moisturizes, softens skin AND relieves minor muscle and joint discomfort. Jade Magic was created for our daughter who, while serving in the U.S. Army, developed Compartment Syndrome in her legs. This caused her to have continuous pain that even surgery could not relieve. Jade Magic was created for those with sensitive skin. It is free of any narcotics and does not cause increased heat on the applied areas. Jade Magic is all natural and does NOT have an offensive odor like most other products that leave a camphor or menthol odor as it dries. This ointment is concentrated, so a small amount will cover a lot of skin. When applied the ointment becomes clear and dose not stain the skin. The light green color comes from the Goji leaf infused sunflower oil. The Goji leaves used come from plants grown organically on Spirit’s Bounty Farm in Kentucky, U.S.A..
Goji and Elderberry extracts naturally have Vitamin A and Antioxidants. If you are pregnant, or think you may be pregnant, consult with your health care provider before using this product. This product is not intended to diagnose or treat any disease. Ingredients: Organic Shea Butter, Bee Wax, Kentucky grown Goji leaf infused in Sunflower Oil, Copiaba and Myrrh Essential Oils, & SB Formula Mix of Homeopathic Anti-Inflammatories.